I adapted Christoph Janz’s methodology, an investor in cloud technology companies with the goal of showcasing that it is possible to reach the $100 million dollars per year mark. The answer to that challenge is: niche market! Here is a warning: no matter what your annual revenue goals are! Understand this methodology! It will be very useful for your company. But, market niches in accounting firms? Many people, who mean well, give their opinions on the subject. Some claim their own experience to establish a position. Others just position themselves with emotional arguments. But, at the end of the day, very few have any actual conceptual basis on the subject. The truth is, because of the lack of basic knowledge on the market’s science called methodology, commonly known as Marketing, most accounting entrepreneurs still believe that acting in a segmented way means using their clients’ branch of activity to decide which they will and will not attend. In reality, the market’s segmentation involves multiple variables. Briefly, it involves geographic and demographic characteristics and services’ type of use. The branch of activity is only a demographic factor that can be taken in consideration (or not) when we are defining market niches. So… what about the $100 million? Showing that the segmentation isn’t (only) select clients by industry. Presenting a segmentation technique that will help accounting entrepreneurs grow immensely and, maybe, they can to the $100 million mark. The ordinate axis (y) shows the average annual revenue per account (ARPA). In the x-axis, you can see how many clients you need for a certain ARPA, in order to make $100 million in annual revenues. Both axes use a logarithmic scale. 100 million clients, each paying $1 per year. Righ now, you must be thinking: $1,000 per year? That’s impossible! Well, maybe you don’t want to get into this market, but I suggest you continue reading the explanation below. If you think about it, 10 years ago, who could’ve predicted that an accounting firm could have 10.000 companies paying $50,00 per month? Anyway, who gets to decide what the ARPA target, in other words, the niche that the accounting company wants, is the entrepreneur. You need 100 million active users to build a $100 million business. This means that you will need hundreds of millions of downloads or subscriptions in a digital service, which requires an insanely high viral coefficient. If it happens, that’s amazing, but it is difficult to bet with a lot of advance. The microbe, in accounting solutions, is something extremely hard in just one country or region. Microbes would only work if the business was global and digital: marketing, sales, attendance and delivery 100% digital. Having “tons” of content sparked by users to generate gigantic SEO traffic. Whatsapp, Instagram and Snapchat are examples of services that got successful by hunting flies. Some Brazilian initiatives have already been created to monetize communities in the tax areas, and especially in relation to Tax Technology. None of them seem to have achieved the necessary degree of exposure to monetize themselves in the millions. It seems kind of obvious as there is not enough audience for this. According to data from the Federal Accounting Council, we now have 530,165 registered professionals. Even considering that there are people working in the tax area (and in tax technology), it does not seem reasonable that we have more than one million professionals in this sector. To get a million consumers who pay around $ 100 a year, you will also need a high level of exposure. To achieve this, the client’s journey (discovery, use and recommendation) must be fast and intense. That is, the service should be so good and so important in people’s lives that they are eager to share their experience. Good examples of mice hunters are Evernote, Dropbox, Prezi and Mail Chimp. Again, for accounting services, I can’t see any alternative other than the individual market. Let’s be real, convincing 1 million people to pay $ 9.90 per month remains an arduous and undoubtedly digital task at all stages of the process. Most people who work in the online world with small enterprises charge something like $50 to $100 per month, which means the annual ARPA is around $1,000. The problem is that the revenue is insufficient for outbound actions, so the strategy to hunt bunnies should be based on the “tripod”: extraordinary product, an extremely high NPS (Net Promoter Score) and an exquisite inbound marketing. 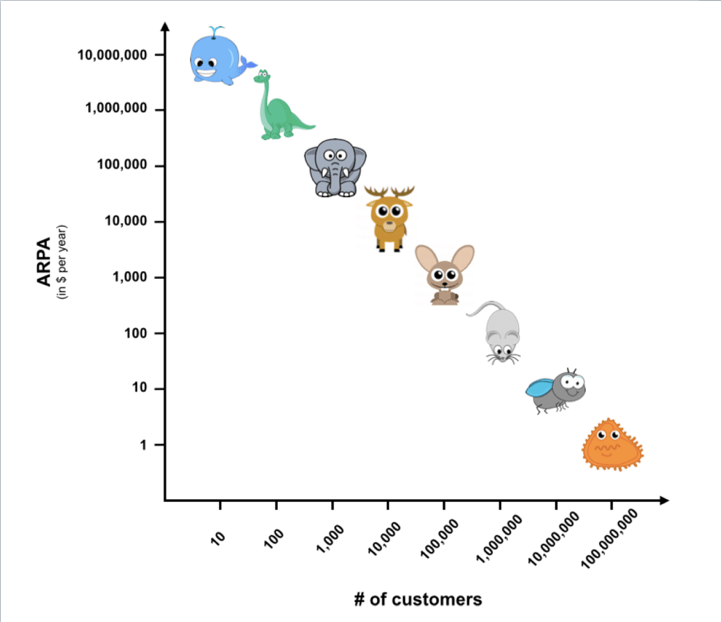 To acquire 100,000 of these customers, you need something around 1 million test registrations, considering your 10% conversion rate.Let’s assume your LTV (life time value) per customer is $ 2,700 (assuming a 3-year average customer service life and a gross margin of 90%) and that you want your LTV to be 4 times the cost of customer acquisition. In that case, you can spend $ 675 to acquire a customer. If your conversion rate is 10%, it means you can spend $ 67.50 per free subscription.So how can you get 1 million sign ups investing less than $ 70 in marketing? Again, there is no “silver bullet” but the closest thing to that is a sensational marketing – besides having a fantastic product with a very high NPS and being obsessively focused on sales funnel optimization.Another option is an OEM strategy (getting your product distributed by great partners), which can work.In the accounting services market we have more than 30 companies in Brazil hunting rabbits. Most have embarked on this wave by fad and will have to deal with big losses. These are the so-called online accounts or “Do it yourself” accounting.Maybe two or three will survive. But most certainly, most of them didn’t even study the “rabbit” market before investing their savings. I can guarantee that few are familiar with the concepts of CAC, NPS, LTV. If you are a deer hunter and want to get 10,000 customers paying $ 10,000 a year, most of the rabbit hunting tactics still apply. An ARPA of $ 10,000 a year is generally not enough to make field sales face-to-face and you probably still need to get 100,000 or so leads. The main difference is that when you are hunting deer, you can use an inside sales force to convert leads into contracts. This also means that you can pay an attractive commission to the partners. The term “Inside Sales” came up with the initial goal of differentiating the new model of complex sales remotely made from the traditional telemarketing used in an exaggerated way by American companies since the beginning of the 50’s and that became popular in Brazil in the 90’s.Here is an extra explanation, since this difference is crucial for you to better understand the concept we are discussing. Traditional telemarketing is focused on a single connection with a previously defined script and in which the often not very prepared salesperson will insist that you buy the product almost mechanically.The Inside Sales model works best for selling more complex products and requires a certain level of knowledge from the seller so that, through a series of virtual meetings, the deal is closed. (Source: https://resultadosdigitais.com.br/blog/inside-sales). In the market of accounting services, most companies deer hunt. The problem is that they don’t have sales force and no partners to attract new customers. To deer hunt, it is also important to be aware of the concept of digital accounting. While online accounting is restricted to bookkeeping and demonstration, the digital accounting model proposes to use information technology to automate bookkeeping and demonstration as much as possible, freeing up time for performing higher value-added services. The best way to understand the concept of digital accounting is by looking at the internet as a medium for performing accounting tasks. The proposal is to use ERP cloud systems to connect the office to your customers. Using online accounting concepts, accounting service providers can perform Digital BPO to achieve monthly fees above $ 3,000. In digital BPO, the accounting firm processes all accounts to pay and receive from its customers, for example. But it uses a cloud ERP to simplify and automate the process of communicating with companies. With monthly fees above $ 3,000, to have an accounting firm of $ 100 million you would need less than 4,000 clients. That is, if you are deer hunting and have not yet professionalized your area of ​​marketing and sales, beware! Maybe it’s time to join the sales machines that are being built by franchisors and other types of accounting office networks. Or create your own … Before it’s too late! Whether you like it or not, most of the biggest companies in the technology world get most of their revenues through selling expensive subscriptions for big companies. SalesForce.com and SAP are examples of successful cases when it comes to hunting elephants. After all, you only need 1.000 clients and the $100,000 you need from each of them is less than the value they spend with the salary of a good professional. BPO- Business Process Outsourcing – is what many accounting companies are doing to get a monthly revenue superior to $10,000 of their clients. Some of them are already implementing ERP in the cloud for their BPO clients with the goal of reducing operational process costs and aggregating more value to their clients. BPO has a big advantage: the accounting companies work with the minimum fixed cost, because it uses the client’s infrastructure. In this business model, the attraction of leads, in general, is presential. Events, visits and participation in fairs. The conversion of leads to clients is done by a specialized sales team and the after sales, which means, the operation, is totally personalized. Another way to reach $ 100 million is with 100 clients, each paying $ 1 million per year. Or 10 customers paying $ 10 million per year. In the accounting world this path has already been traced by the Big Four, which, incidentally, have already passed the annual revenue of $ 30 billion. That is, no one can say that this is impossible. In short, if you want to have an accounting services firm of $100 million, work in a “niche”. The niche, in this type of analysis, is defined by the average annual revenue per customer (ARPA). For every “animal” you are hunting, there is an ideal business model.If you hunt several different animals, your processes of attracting leads (marketing), conversion of contracts (sales) and delivery of services (operation) becomes inefficient and handcrafted. And your company lives a corporate schizophrenia! For each animal, the people responsible for marketing, sales and operation have to adjust the behavior and their work tools.So, acting in a “niched” way, according to Christoph Janz, is having clarity about which animal you and your team are hunting.It is a fact that, whatever your target animal is, it is essential to professionalize marketing, sales and deliveries. Even if you want well less than $100 million. Previous Previous post: Two serious mistakes that your accounting firm can not make.